My yesterday's lunch was at Istana Krakatau, located at Driving Range Jln Putri Hijau no. 1. Medan. This restaurant is my default place for meals out for work purpose or just when I crave for some Indonesian dishes. Food is always consistent there and the price is right. They have both outdoor and indoor dining areas. Here were what me and the work partners ordered : Deep Batter Fried Squid Rings (Idr. 35K) Green Chili Fried Chicken (Idr.40K) Daun Ubi Tumbuk / cassava leaves in coconut milk (Idr. 16K) And the one at the bottom is Udang Kelong Saus Padang / Padang Sauce Prawns Idr. 80K. 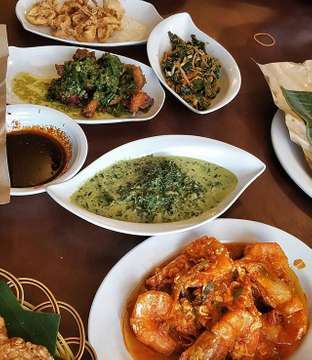 According to my tongue, everything on the table was very good and was something I want for when I'm yearning for some Indonesian food. Before I hv to end this writing, here is a quick shoutout for my endearing foodie friends @batamliciouz @iheartpku @licsaysyummy and not forgetting the Thunder Buddy Ted from @foodandholiday! Have a good and yummy Thursday everyone!